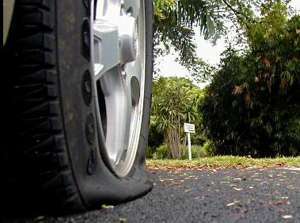 Mission Valley Towing can install your spare tire or in some cases repair your tire roadside. Obviously, some tire can’t be repaired. The biggest problem is that people drive on their tire after it’s gone flat. If we can find a nail or screw in your tire, your tire could possibly be repaired using a tire plug. We always test the fix by looking for bubbles at the spot of repair. If the tire isn’t repairable, hopefully, you have the proper spare. Without a proper spare we could flatbed your vehicle to a tire shop of your choice.